Linguistic note: The New Larousse Encyclopedia of Mythology gives `Spirit of wheat' as the meaning for Her name, but it is not believed that wheat existed in America before Columbus brought it to the Weat Indies in 1493. However it seems likely the concept of Onatha, as a Goddess of cereal produce, existed prior to this time. I have therefore introduced `grain', in its non-specific cereal connotation, as a more likely meaning of Her name. Description: Maiden Goddess of grain, its underground sojourn as seed, and the abundant harvest it produces; She Who setting out one day to look for Refreshing-Dew, was carried off by the Spirit-of-Evil, imprisoned in the darkness of the earth and, when finally found by the sun, restored to the fields She'd deserted. To whom is sacred: dew. Male associate: perhaps Oshadagea, (variant Onager), ----, the Big Eagle of the dew. He bears a lake of dew in the hollow of his back; when he flies up the beneficent moisture falls drop by drop from his outspread wings. How similar to the abduction of Greek Core, qv. Perhaps to be identified with Longfellow's Wenonah, below. 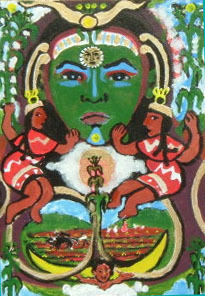 Description: Earth mother; Goddess of life. To Whom are sacred: Cavities, in the earthern floors of homes, in which Her sculpted image was kept. Description: Mother Earth; She Who, immanent in the earth, lies beneath the clouds; She from Whom is derived the Water of Life; She Who feeds plants, animals and humanity at Her bosom. Male associate: Her Grandson: Nanabush, `---' (also known by many other names), the Great Hare. Some say Mother of Onatah, above. Longfellow calls Her mother of Wenonah, below. Sources: C,R.GG 38; C,R.MIE 232; M,P.BGH 222; NLEM 428, 430. Perhaps to be identified with Onatha, above.